Celiac disease has given me the rare opportunity to replace many items in my kitchen, one being the oven gloves I use. I have cloth gloves and squares but they get food on them all the time, are in constant need of washing and don’t always come out of the wash looking like they’ll save my fingers from a burn. I had a hard time keeping the gluten separated from non-gluten and I ended up ruining my oven gloves from over washing. In need of oven gloves that are easily washable, I bought these Heat Resistant Silicone Oven Gloves on Amazon.com. I got the orange and grey colors – the orange are my gluten-free gloves and the grey are for the gluten. I love that they come in a pair, as you do need one for each hand. The gloves are dishwasher safe and do a good job of protecting my hands from the heat. The critiques I have are that they are fairly large gloves. I’m average size, 5’5” and about 140 lbs. and my hands swim in them. A smaller size would be nice, but I imagine if they were too much smaller, the gloves wouldn’t be easy to put on my hands. Also, if a pot touches the inside lining where there are no nubs, the heat comes through the glove and stings. It leaves a slight red mark on my skin, but I not a serious burn, so they did protect my skin, although I only held the hot pot a second or two. These silicone gloves work well for keeping your hands protected from the heat, even if they are a little on the large side. Sometimes I use them without putting my hands in the silicon oven gloves, but it is better to wear them when pulling things out of the oven or microwave, so I don’t burn the tops of my fingers. I haven’t run them through the dishwasher because I don’t like to put silicon in the dishwasher. We have hard water and I don’t trust the plastic from being damaged by dishwasher soap, so I wash them by hand. They hold up well with daily use and washing with Dawn and hot water. All things said, they were a good buy for $9.99. Hello there! Today I made these delicious blueberry scones that came out tasting incredible. I used a box mix for traditional scones, Stonewall Kitchen Traditional Scone Mix and added half a can of Oregon Blueberries at the end. I enjoy the Stonewall Kitchen brand of gluten-free mixes and have tried other gluten-free mixes under that brand. Stonewall Kitchen has easy-to-follow directions and base ingredients that allows you to add your own flavors and spices, plus they usually come out tasty and moist, not dry, unless I make a mistake on the recipe. I mostly followed the directions on the box. I’m not a big butter fan, or my body hasn’t been lately, so I used half coconut oil and half Smart Balance Extra Virgin Olive Oil dairy free butter. It should be a solid type of oil for the mix to crumble and hold properly. The mix calls for 2/3 cup cold water and 1 large egg, slightly beaten. Keep a tablespoon of flour aside to coat the pastry sheet or counter before spreading the mixture. I don’t have a pastry sheet, so I put wax paper down on the counter and then sprinkled the tablespoon of mix on the paper, it worked great! Add butter/oil to mix and cut with a pastry blender, fingertips or a fork, until the batter resembles coarse crumbs, then add water and egg until just mixed. I lightly beat the egg with a fork in the measuring cup for the water before adding it to the mixture, mixed all the ingredients until they were blended and folded half a can of drained and rinsed blueberries into the batter. 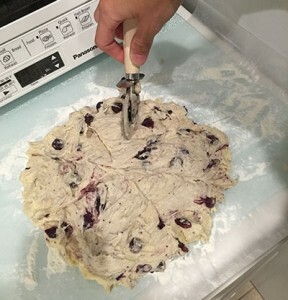 Then I took the dough ball, it was pretty moist and sticky, and spread it onto the wax paper, making about an 8 inch diameter circle and used the pizza cutter to slice it into 8 pie-like slices. 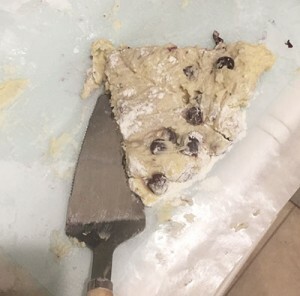 I used a pie spatula to pick them off the wax paper, greasing it with some coconut oil to make it easy for the dough to slide off the spatula, and placed the sliced scone batter onto a parchment paper lined cookie sheet. The directions say to bake at 450 degrees for 10-12 minutes, I cooked my scones about 12-14 minutes, until they were semi-golden on top. They came out so delicious! I was glad I added in the blueberries. The first time I made the scones I didn’t add fruit and they were a bit too dry for my liking, though moister than other scones I’ve tried, though it hasn’t been many. I was never a big fan of scones because they were a dry pastry and I prefer moist cakes. The Stonewall Kitchen Gluten Free Scones have a plain, vanilla flavor, as I imagine most scones have, but even plain they are more moist than other scones. The fruit adds even more moisture and so much flavor. In retrospect, I could have used the whole can and gotten an even tastier scone. I bought a can of cherries too, so with the next box I might use the cherries. I’m still on the fence with buying canned anything, but that’s for another post. Any other ideas for the cherries? 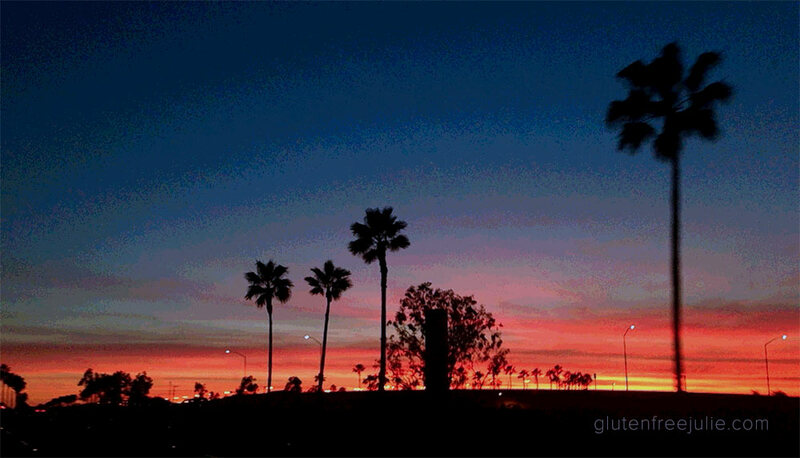 This post is a follow-up from Anxiety & Celiac Disease. The fact that the B-Complex vitamin calmed my anxiety made me wonder, so I did more research and found that anxiety is rarely a mental issue. In fact, most health-related issues are related to something we’re eating – the gut is our only line of defense against the outside world. Researchers have found that serotonin and dopamine (the happy hormones) are not produced in the brain, but in the stomach and then carried to the brain for release from the hypothalamus. Serotonin is made from processing B vitamins, among other vitamins and minerals, in the small intestines. When you have celiac or autoimmune disorders, you most likely have a leaky gut that small particles of food is allowing to escape into your body. Your body knows it’s not supposed to be there so it goes on attack, causing all kinds of symptoms like bloating, itching, sneezing, allergies, anxiety and panic attacks, fatigue, acne and many others. Upon further research, probiotics are also incredibly important for those with anxiety and GI related disorders. Your doctor may not bring it up as a possible option to you, but you can bring it up to your doctor. I don’t recommend going off prescription dugs without the consult of a doctor, as they can really throw you through a loop and serious issues can occur. I’ve also read that people who are on anti-depressant or anti-anxiety meds can have increased symptoms adding the complex-B vitamins, however I wonder if that isn’t due to the ingredients in the pill or the type of pill it is. I take a whole food B-complex vitamin, however one of the whole food ingredients in the pill, brewer’s yeast, can cause bloating issues in some people. Before doing anything drastic, take stock of your situation. Educate yourself on natural ways to help anxiety, B-vitamins, leaky gut and wherever those things take you. Print out some good articles you find interesting or have questions about and take them to your doctor. I’m super curious about your experiences with trying to naturally help your anxiety. Have you tried B vitamins, probiotics, Vitamin D, something else? I think it has to be the Complex-B, with all the B vitamins, not just one or two. Adding magnesium helped me a lot as well, Natural Calm plus Calcium has helped the most, but only in conjunction with an additional Calcium/Magnesium pill. What have you found that works? Anxiety is a big part of my Celiac disease, and I’m learning more and more about it every day. My first anxiety attacks were when I was about 4 or 5 years old. I would be in bed at night and I remember being very afraid of falling asleep because I was afraid I wouldn’t wake up. It would make me sad and scared, I would go down to my parents and cry, saying I was afraid of dying. Reflecting back, I wonder now if they weren’t panic attacks but warning signs that my body was ingesting something it shouldn’t. I first realized that I was having issues with anxiety when I started having panic attacks in 2010. My husband and I had just moved to California and I was working a job that required walking into businesses, most without appointments, to sell ad space. Normally, I wouldn’t have a problem with meeting new people. I worked in people-facing businesses my entire career-life, it shouldn’t have been hard for me, but it was. The beginning was great, I landed a big sale and was told by my manager it was one of the best pitches she ever heard. Unfortunately, a good sales pitch wasn’t enough, especially when they couldn’t deliver on the promises I was instructed to make. I tried to do well but soon realized it wasn’t for me and after a few months, I started having minor anxiety attacks that started with my heart beating faster. After a little while, tears would come. Sometimes I would just be sitting there at a sales meeting and these choking tears would come out of nowhere. My chest would start heaving and I would feel like I couldn’t breathe. I would see stars and had this horrible feeling of wanting to crawl out of my skin. I would excuse myself, go into the bathroom and try to pull myself together, but once I was alone the tears would start and not stop. I would go back out with red eyes, hoping no one noticed, but people asked questions. I chalked the attacks up to the increased stress of my job and ended up leaving the company – it wasn’t worth the panic attacks. After some research, I found that the thyroid medication I was on wasn’t doing enough. I was taking Synthroid daily, which replaces T4 in the body. Many doctors prescribe Synthroid because the body takes T4 and produces T3. What doctors don’t understand yet is that when you eradicate the thyroid by either radioactive iodine treatment (RAI), radiation or surgery, it doesn’t work properly, nor does the thyroid work well if you’re inflamed. In my case, I wasn’t making enough T3. I did some more research and switched to Nature-throid in 2010 and that helped so much. Getting out of the job helped a lot, too. But things didn’t really get better after that. I felt a little better, but my anxiety got worse. I would cancel plans with new friends at the last minute because the thought of interacting with people got me so worked up that I couldn’t leave the house. And that made me feel worse, because I thought I would be considered flaky or unreliable. Even though I wasn’t feeling well, I still functioned and after that job I began doing web and graphic design full-time, meaning my interaction with people on a regular basis was drastically reduced. During that time quite a bit happened. I broke my right ankle and then we had to move because the house we were renting was being foreclosed. We moved back to Philly and lived with family until our condo was available. We fixed up the condo to rent it out again and then I broke my left leg slipping down our spiral staircase. I had a spiral fracture and a broken ankle from that fall. I wore a cast for a couple months, but my leg never fully healed. We decided to sell the condo and moved again, this time back to California, where our west coast family was kind enough to house us until we both became employed. My anxiety attacks started up again, this time they would start while I was getting ready for work. I thought it might be the job, but I liked the people I worked with and was in a good position. And after I was at work for a little while, I would calm down, so it couldn’t be that. I realized it was my drive into work that was causing the panic attacks this time. It wasn’t a super-long drive, about 35 – 45 minutes, but I had to take the I-405 freeway to get there, which is 5 lanes of wall-to-wall traffic. I tried taking the surface streets a few times, but even with traffic the 405 is faster and I could never seem to leave early enough to take the long way. I chose the 6am – 3pm shift just so I could miss some of the traffic and spare a little sanity. Eventually, the company was sold and I didn’t have to take the 405 at all, and my anxiety attacks stopped. I did find out something interesting though. One day when I was having one of the panic attacks, I took my B-complex vitamins when I got to work because I was really tired that day (I stopped drinking coffee) and needed a boost. When the B vitamins took effect, I felt an immediate calm come over my body and my head was crystal clear – I didn’t feel foggy at all. This made me wonder…could it work? 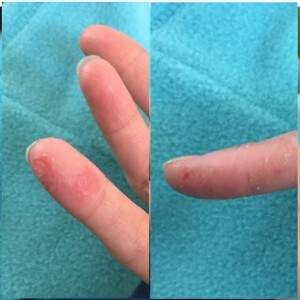 Have you ever burned your fingers and they took forever to heal? That’s what’s going on with me this month. 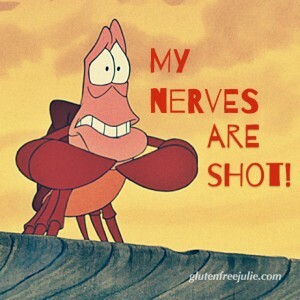 As Sebastian would say, “My nerves are shot!” I have nerve damage from celiac disease and boy does it feel weird and yet not feel at the same time. I feel the nerve tingling more at night, in my neck, back, hips and shoulders. Then there’s the forgetfulness and memory loss, forgetting things told to me or that I did recently and losing memory of past events. Dropping things when I know I have a good grip on them. It’s a real PITA. I’m realizing that my high tolerance for pain is most likely due to nerve damage. I know part of my ability to handle the pain is because I’ve trained my mind to block it, but I think part of the pain is due to nerve damage. I burned my fingers, bad, by pulling a dish out of the microwave and taking the top off. I’ve done this countless times before and have had issues with the skin on a couple of fingers on and off, but I never put it together. This time I paid more attention, that or it’s possible my memory is finally starting to get better, but the skin issues I’ve been having on my fingers are due to burning them on the ceramic. My fingers can’t feel how hot they are until it’s too late, so when I finally notice it’s too hot, my skin is already burned.